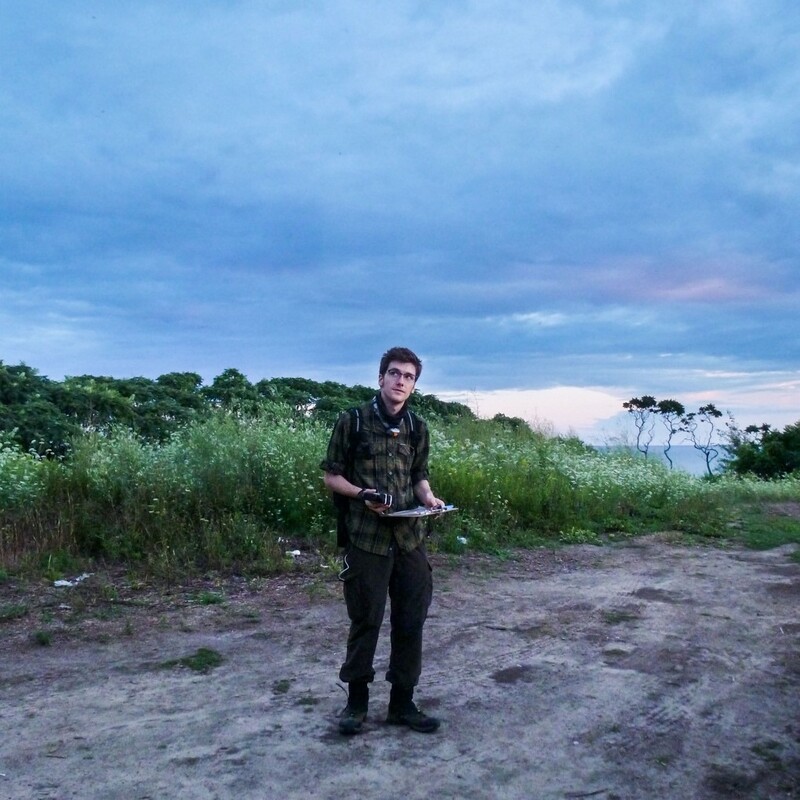 This week, Dispatches from the Field is excited to welcome guest blogger Toby J. Thorne, who tells us about some of his adventures wandering the deep dark night in search of bats. Bats are rather mysterious creatures. Most people I talk to about bats think they are interesting, but don’t know much about them. It’s not all that surprising; unlike more obvious wildlife such as birds, people don’t encounter bats very often. After all, they are active at night, when people like to sleep, and even then it’s hard to spot small and flying creatures in the dark. A Natterer’s bat taking off from a tree roost in the UK. 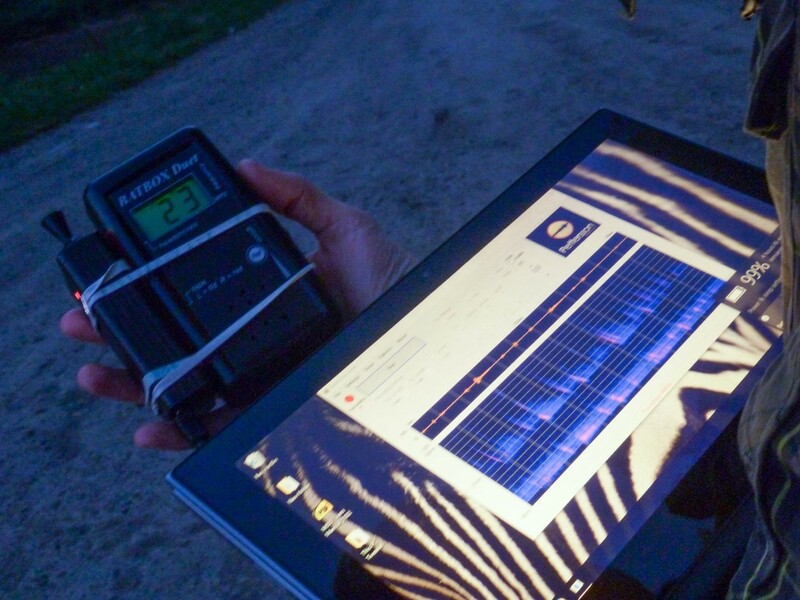 Happily, surveying bats is easier than you might think. 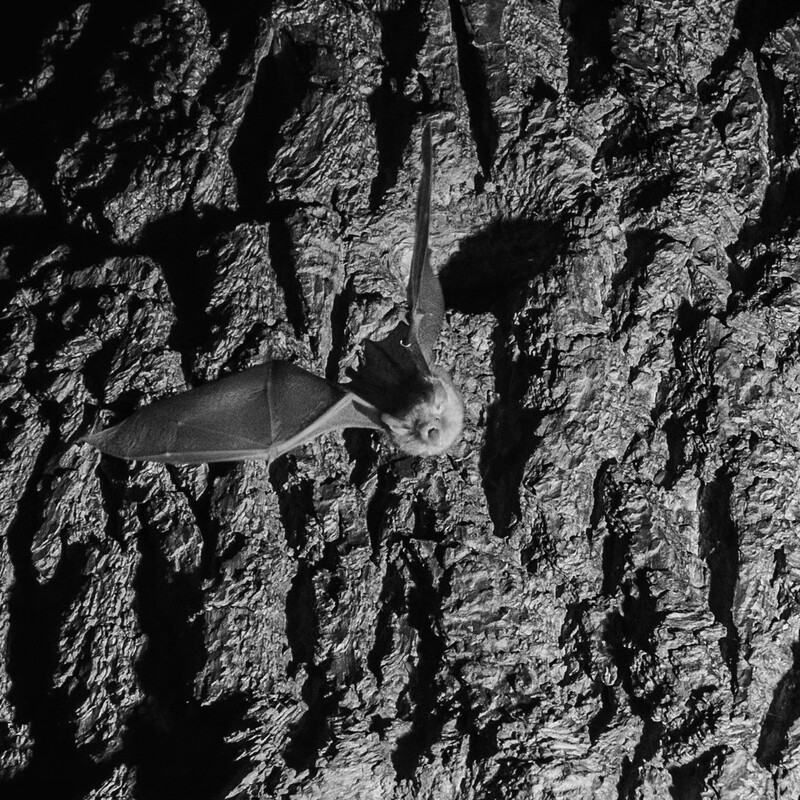 Most bats (and all the ones found in Canada), find their way around in the dark using echolocation: emitting sounds and listening to the echoes to avoid obstacles and find prey. We don’t hear these sounds because they are at higher frequencies than we are able to hear, but a variety of devices known as ‘bat detectors’ can convert the sound into our hearing range, or record the bats (there are several more affordable bat detectors available if you want to learn more about your own bats!). With a bat detector in hand it is as if the bats are flying around shouting ‘I’m here! I’m here!’ What’s more, different species make different sounds, so it’s sometimes possible to identify the species of a bat based on its echolocation calls – though some species are more difficult than others, and the technologies, although improving, are far from perfect! A big brown bat – in my experience, the most commonly encountered bat in southern Ontario. If you have bats in your garden or home there’s a good chance it’s one of these! Please note that the bat’s mouth is open to facilitate echolocation more than aggression. 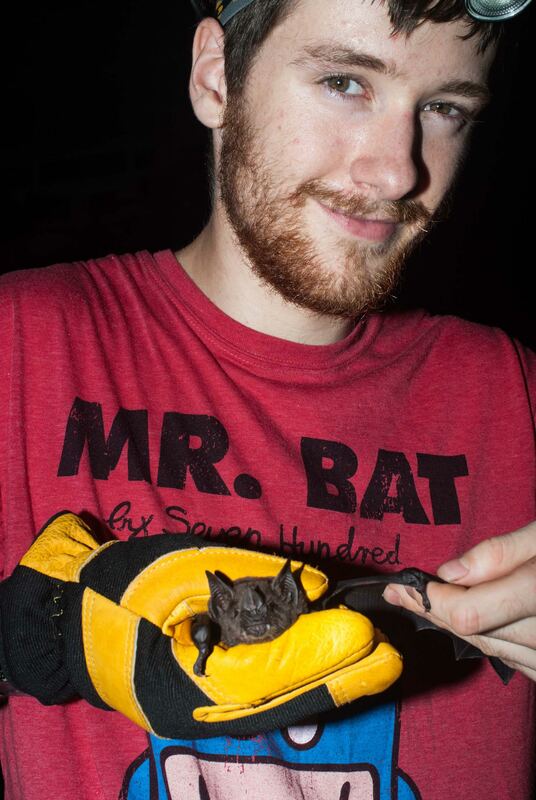 I’ve listened to bats for a variety of projects, along with my own enjoyment, including recording several million calls during my master’s research. Last year (2015) I was approached by Thames Talbot Land Trust to survey for bats at Hawk Cliff Woods, a site they are in the process of acquiring. Before heading out to survey, I used maps and satellite images in order to pick a transect route to walk. Hawk Cliff has a mix of forest, meadow and a field that is currently being farmed, and I wanted to cover as much as possible as different bat species have differing habitat preferences. At Hawk Cliff setting off on my transect. I arrived a little before sunset, giving myself some time to look around in daylight. I also took the opportunity to record a few waymarks that I thought would be difficult to locate in the dark with my GPS. Then it was time to get my kit together, and wait for the bats to arrive. I had a heterodyne ‘bat detector’, which allows me to listen live to bats’ echolocation and get a constant idea of activity – even when I can’t see anything. I also had an ultrasound sensitive microphone that records onto a tiny laptop in my backpack, I can review these recordings later to confirm species that I missed or couldn’t identify on heterodyne. I also had a smartphone with GPS and maps, to find my way and record it so I can geotag my recordings later. 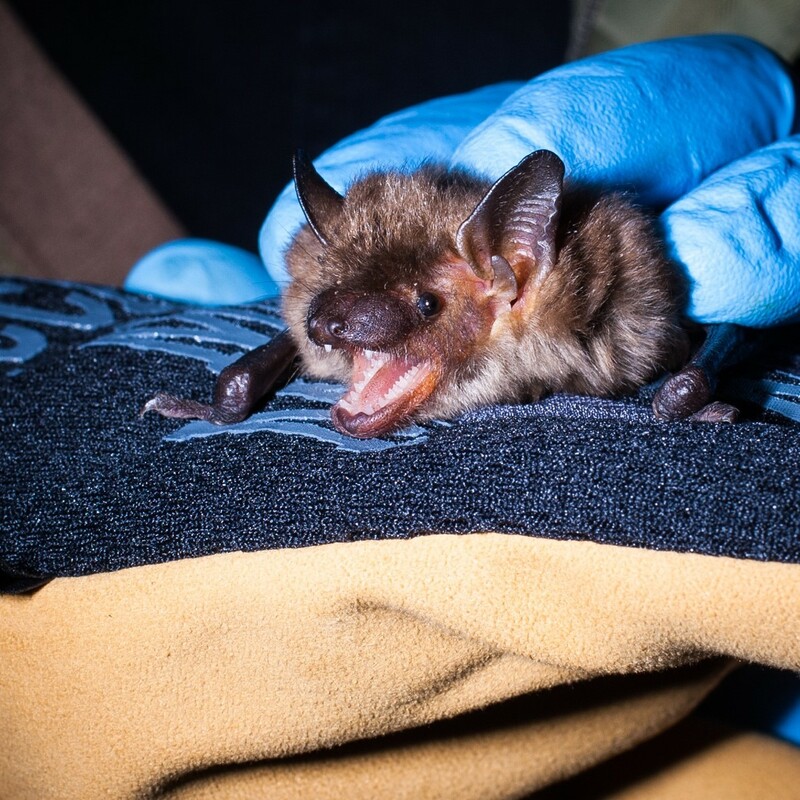 Lastly, I had a notebook and a couple of flashlights – nocturnal biologists love flashlights! I try and time the beginning of my survey to be when bats start to become active, although this varies depending on how close you are to a roost and how dark it is, cloudy vs. brightly moonlit light for example. Activity at twilight is perhaps the most important. At this time, it’s unlikely that bats have travelled far from their roosts, so hearing them early suggests they are living close by. Also, for a brief time at twilight enough light remains that I can see the bats. This is something anyone can do without any special equipment; just go out in the twilight and look up (obviously this works best in the mid-summer, when bats are most active, and is pointless in winter). Bats’ fluttery flight is quite distinct from the more direct flight of birds. I love watching the aerobatics of bats in the dusk light, and it’s often possible to identify if bats are close to a roost – they sometimes fly around the entrance – or are feeding, characterised by sudden, rapid changes in direction to intercept prey on the wing. On my transect at Hawk Cliff, twilight activity was mostly made up of big brown bats, the species I encounter most in Ontario, with a few eastern red bats bringing variety. As the darkness draws in it becomes impossible to see bats even when they’re flying over my head. But with my bat detectors in hand I can still tell when they are there. Activity can become less intense as the night goes on. Many species gorge themselves at sunset and then take things easier for the rest of the night. Activity is also diluted as individuals disperse through the landscape. A closer look at my bat detecting setup. In my hand is my heterodyne detector, with my ultrasound microphone attached to the side with highly technical elastic bands. I usually like to have my laptop running in my backpack so I’m not distracted by the screen, but here I have it out to check the microphone is functioning correctly. It is, as demonstrated by the big brown bat echolocation calls visible in the spectrogram on the screen! Finding my way at night, even at sites I am familiar with, often leads to interesting times. At Hawk Cliff I had planned part of my transect to pass through the forest. For the first half of this section I was able to follow a trail, and things were easy. I then crossed a ravine, luckily without too much difficulty. Finding my way out of the forest was more difficult as there was no trail, but I made it with the minimum of bushwhacking. However, things were more complicated a few weeks later when I returned to repeat my survey. This time the ravine was filled with goldenrod that had grown up above my head, and it took me almost forty minutes to find a safe route to cross. The effort was worthwhile though, as in and around the forest I heard several rarer species, such as the threatened little brown bat. Another picture of a big brown bat, showing the wing extended and the general size of the bat. 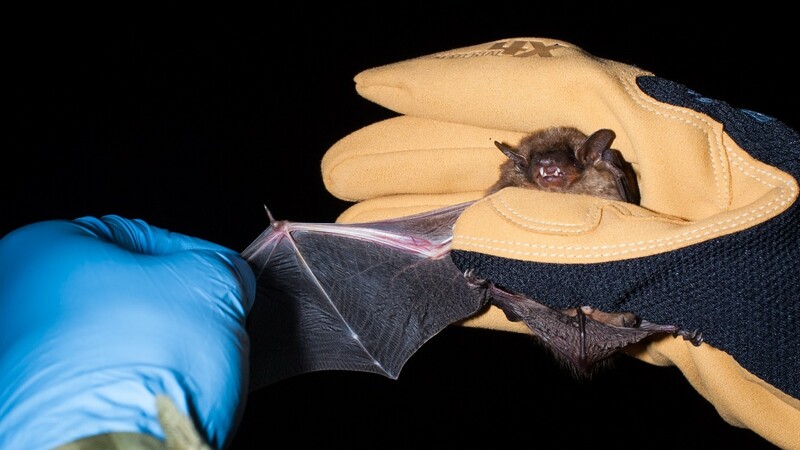 This bat can give a painful bite, which is why I am wearing a thick glove. Even when I did get home, there was still work to do. I have to go through the recordings from my microphone to confirm the identifications of bats I heard and then cross reference them with my GPS file to get a map of bat activity. I like to do this step as soon as I can, while observations are still fresh in my mind, and then write my final report. A picture of a little brown bat along with a spectrogram of its echolocation call. 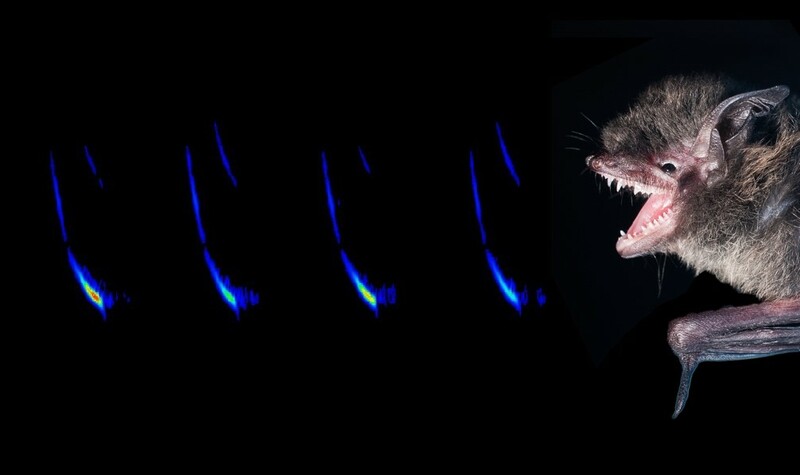 Spectrograms are visual representations of the frequency, temporal and amplitude characteristics that are used by bat biologists to try and identify species based on echolocation calls. Again, the bat’s mouth is open to facilitate echolocation, rather than in aggression. Learning to listen to bats is a great way to experience wildlife in a rather novel way. Of course there is a limit to what we can learn just by listening and to answer some questions we have to catch bats, and I enjoy doing that too. However, I’ll always love seeing bats in their element – even if sometimes my ears have to do the seeing.